00:47 - Vaping: safer smoking, or a gateway to teen addiction? Vaping seems to be safer than smoking, but is it causing more teenagers to take up the habit? Vaping: safer smoking, or a gateway to teen addiction? Lion - In our study, we are interested to have a look at the relative risk of using e-cigarettes compared with standard conventional cigarettes. We looked at long term users of these products so these are people who have been using e-cigarettes for at least one and a half years and we compared their exposure to various cancer causing chemicals with people who smoke cigarettes. We also had other control groups which were people who were using nicotine replacement therapy, or those who had stopped smoking. Nicotine replacement therapy are things such as patches and nicotine gum. 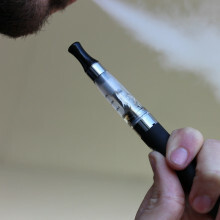 Compared with cigarette smokers, those people who completely switched over to e-cigarettes dramatically reduced their exposure to these cancer causing chemicals to between 50 to 97 percent reduction of the levels of cigarette smokers, and the levels were very similar to people who use conventional forms of nicotine replacement therapy. Chris - Therefore, on the basis of what you have seen from your study, what conclusion do you draw? Lion - I think the main conclusion I draw from this study is that some of the literature out there on the risks and dangers of e-cigarettes probably overstates the harm that they can cause. Certainly, compared with the use of conventional cigarettes, those people who did switch over to using e-cigarettes dramatically reduced their exposure to cancer-causing chemicals, meaning that it’s likely that it reduces their risk of subsequent diseases, including cancer, greatly. Chris - Well that sounds very encouraging but, on the other hand, Richard Miech, you’re coming at this from a different direction. What’s your perspective? Richard - We looked at it slightly different research question. So, as you pointed out in the introduction, there’s a lot of debate right now about whether e-cigarettes and their use among teens is leading them to become smokers or whether, alternatively, kids are vaping instead of smoking. What we did is we interviewed a group of 17 year olds and then we followed them up a year later. So, among kids who had never smoked at the baseline, those who were vaping as compared to those who weren’t vaping were about four times more likely to have smoked a cigarette in the following year. And among kids who had smoked in the past but weren't current smokers at the baseline, we’ve found that those who were vaping were also more likely to come back to smoking and they were about twice as likely to have smoked a cigarette in the past year. Chris - I suppose you can’t really tell though whether those individuals who vaped and then smoked, or carried on vaping, were just going to become smokers anyway? Richard - We actually looked at that. We had a question at the baseline: how dangerous do you think smoking is? And we had a sizeable group who said that smoking was the most dangerous thing you could do. So we just looked at those kids who wouldn't seem to be likely to go onto smoking and, even among them, we found that those who vaped were more likely to smoke. We also found that among the kids who were vaping, those who thought that smoking cigarettes was highly dangerous at baseline were more likely to move away from that view. They’re more likely to reduce their perceived risk of smoking as they vaped. Chris - What reasons did they give for taking up this habit in the first place? Richard - The predominant reason for their vaping among those who vaped was they wanted to experiment to see what it was like and also that they liked the flavours. Because vaping comes in a wide variety of vapours, some which really appeal to teens like chocolate, or cherry, or bubblegum. Lion - Well, yes. I have to say I’m not entirely convinced that it’s actually possible to prove a gateway hypothesis. We’ve looked at this in the UK, which has quite a relaxed attitude towards e-cigarettes; we have seen an increase in the use of e-cigarettes among youth as well, although the use of e-cigarettes among non-smoking kids is very, very low indeed. And we can compare this with a country where e-cigarettes are not really widely available, such as New Zealand, and what you see when you compare the trajectory is that the decline is very comparable. So the proof is in the pudding, in a sense, that, indeed, if there is a gateway effect from using e-cigarettes to using cigarettes, then you would expect, in the long term, that the decrease in cigarette consumption, in cigarette prevalence in youth should stop. But this is not the case, and neither is it the case in the US where I think the latest data shows that levels in cigarette consumption is the lowest since recording has started. Richard - Yes, that is true in fact that there’s a historical low in the level of cigarette smoking among teens in the US. They're our studies, one that actually was the first to report this. But actually, that’s a long decline that started more than two decades ago and I’d like to point out that the decline started well before e-cigarettes even existed. Chris - Do you think then, Richard, that these are an evil thing and we shouldn’t use them? On the basis of this, you’re only seeing a negative, it’s encouraging more people who have previously been extremely diligent and giving up, or not taking up smoking in the first place to embrace this habit? Richard - My main message would be that many teenagers believe that vaping is completely innocuous and it has no negative consequences at all. But I think if word got out that kids who vape are significantly more likely to start smoking, I think many teens would think twice before vaping and, maybe stay clear of vaping devices. Chris - Do you not think that’s a risk, Lion, that it’s not just kids, it could be some of the adults we are seeing who are not smokers but might be tempted to toy with the idea of vaping because it does taste nice perhaps, or it’s not regarded as so bad for you? Lion - Yes, it is a theoretical risk but the data in the UK just do not bear this out. There’s no evidence that I can see currently that non-smokers are taking up vaping. Chris - So in your view it’s a good thing, it’s going to help people to minimise the harms that cigarettes do? Lion - Yeah. Just to reiterate, the vast majority of people who use e-cigarettes are either current smokers or ex smokers. And it is a sad truth that only 50 percent of smokers ever manage to stop smoking their lifetime which means that, in the UK for instance, still nearly 100,000 people die because of smoking and e-cigarettes are, potentially, a way of helping some people who have failed to stop smoking with other conventional forms of support to stop smoking, and they appear to be significantly safer than continued smoking. Chris - Richard, last word from you. 08:19 - Could quinoa solve worldwide food shortages? Sequencing the genome of quinoa improves our understanding of why the plant is able to grow in such harsh conditions. Could quinoa solve worldwide food shortages? Mark - About a third of the world’s food is produced under irrigation and a large fraction of the water sources that are being used for the irrigation are being depleted. We’re mining a lot of the world’s water and as the water is depleted so the quality of the water degrades, and it gets saltier. So we’re actually facing a very big challenge in global agriculture because a lot of the systems that are producing food at very high amounts at the moment are not sustainable. We need to be able to increase the salinity tolerance of crops in those systems. Georgia - The amount of water is going down and, I suppose, at the same time the number of people and mouths to feed is on the up? Mark - Yes. There’s an increase in demand for global food production. The UN Food Agriculture Organisation predicts that we will need at least 50 percent more food by 2050. And yet, one of the major systems of producing food at the moment is threatened with decreasing production, not increasing production. Georgia - So quinoa, as a salt tolerant plant, suddenly looks quite important. Using several cutting edge sequencing technologies, Mark and the term worked out the most complete genome of the plant yet. But so what? Mark - When you’ve got the genome sequence you can do a lot of things. You can have fun, and do things like understand some of the evolutionary processes that have led to the genomes being the way they are. But on a more applied level, once you have the genome then you can then start to look at differences in the genome between different individuals within the species. What we find often is that if you look at a large enough number of individuals and then you characterise those individuals: look at their salinity tolerance, the way they grow, the way they produce their flowers and so on. All the traits which are important to lead to a crop that we can harvest. And you can quantify each of those aspects of the plant and then look at all of their genomes and then what you can do is associate bits of the genome with particular traits and, with that, you can start to discover genes very, very rapidly. That’s what Sandra and the team did with the saponins. Sandra - Saponins are only really harmful in the seeds or around the seeds. So you need to plant a plant, wait for it to grow and produce seeds and then you look at the seeds. So when you do your natural breeding and you’re looking for the sweetness now we have a marker. We know which gene is making it sweet so we can look at a plant and when it’s very little, tiny we can take a little piece of the leaf and look for it’s sweetness. That’s the major advantage of having the genome and knowing what genes are contributing to sweetness because we can look at them a lot earlier than conventional breeding. 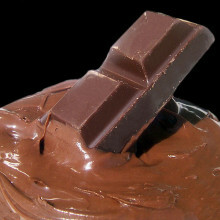 Chocolate contains antioxidants but can we really call it a health food? With Valentine’s day arriving, you might have bought your beloved a box of chocs. But you might want to wait until you hear what Kat Arney’s been finding out about a common chocolate-based mythconception. Kat - Love is in the air - or, at least, the sickly manufactured version of love that passes for Valentine’s day merchandising. And one of the traditional gifts that people buy to show their undying affection is chocolate. After all, everyone knows that dark chocolate is meant to be good for you - so it’s practically a health food, right? Wrong. First let’s take a look at where the idea that chocolate is healthy came from. The key thing is the main ingredient that gives chocolate its name and taste: cocoa beans, or cacao. These are harvested from plants and then fermented, dried, roasted, crushed, ground and pounded to produce rich-tasting cocoa powder and silky-smooth cocoa butter. Like the produce of most plants, cocoa beans contain chemicals called antioxidants, specifically molecules known as flavonols, or polyphenols. There’s a lot of interest in flavonols for bringing all kinds of purported health benefits, from boosting brainpower and lowering blood pressure to helping cut heart disease or even reducing cancer risk. So it makes sense that if chocolate is made from cocoa beans, and cocoa beans contain flavonols that are really good for you, then chocolate must contain loads of flavonols, and must therefore also be really good for you! Alas, it’s not quite that simple. The manufacturing process from bean to bar is not kind to these chemicals. All that fermenting and roasting helps to destroy them, and sometimes cocoa is also treated to make it more alkaline - a process known as Dutching - which gives it a milder taste but can also destroy more of the flavonols. Adding extra ingredients, such as emulsifiers, milk and sugar can also mop up flavonols along the way. Another thing that makes chocolate something to be enjoyed in moderation as a treat rather than a health food is the other stuff that’s in it. Flavonols are very bitter, and are pretty unpalatable unless served with a side-order of fat and sugar. As a result, there’s more than 550 calories in a hundred grams of chocolate, and that includes the really posh dark stuff. Eating too much of anything will make you put on weight - which can increase the risk of heart disease and other illnesses - and packing in a lot of high-fat and high-sugar chocolate is likely to have more of a negative impact on your health than any positive benefits from the tiny amounts of polyphenols. All is not lost, if you still want to believe that chocolate can be good for you. Currently there’s a trial underway in the US testing whether capsules of flavonols purified from cocoa have an impact on cardiovascular health. Unfortunately they don’t taste like chocolate at all, don’t come wrapped in a shiny box, and are way less romantic. And, just to be a total killjoy, fruit, vegetables and beans are much better sources of polyphenols and other antioxidants than chocolate. Of course, there’s nothing wrong with a chocolaty gift if that’s what the lady loves, but let’s stop kidding ourselves that it’s a health food. And if you really want to give the one you love a health boost this Valentine’s day, maybe a box of fruit and veg might be a better bet than a box of chocs. Although I can’t take any responsibility for any hearts broken over a bag of broccoli. What's it like to be able to hear again with a 'bionic ear'? Hearing and understanding speech is something many of us take for granted, but hearing loss is something that affects huge numbers of people. 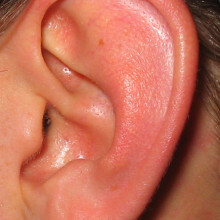 It’s estimated 1 in 6 people in the UK have some form of hearing loss or deafness. And one cause is damage to the inner ear or cochlea where sound waves are converted into nerve impulses that the brain can then understand. For some people a device called a cochlear implant - or as the Australian inventors dubbed it “bionic ear” - can be used to do the same job, but wearers often initially struggle to understand speech. Scientists have been looking into why, and they’ve come up with some strategies to help, as Tom O’Hanlon has been hearing, first from Bob Carlyon at the MRC Cognition and Brain Sciences Unit in Cambridge. Bob - It looks a bit like a hearing aid in the sense that you have a thing behind your ear which has got a microphone in it. This microphone sends the sounds to a little processor worn behind the ear which breaks sounds down into the individual frequency bands, and it then transmits that information across the skin using a little radio frequency transmitter to a receiver stimulator underneath the skin. That then sends that pattern of electrical stimulation to an array of electrodes inserted inside the inner ear and those electrodes stimulate the auditory nerve directly, bypassing the damaged receptor cells which has caused the patient to become deaf in the first place. Mel - When I try and describe what it’s like to hear with a cochlear implant, one way that makes sense to me is that natural hearing that we have is like an acoustic guitar, but hearing with an implant is like an electric guitar. It does take a lot of getting use to but, over time, it does become natural. My dad’s voice now sounds like how I remember my dad’s voice. My mum’s like my mums. Could you make sense of that. I certainly struggled. Matt - The speech is hard to understand, but if you give people hints and clues about what they’re hearing it starts to sound a lot clearer. Tom - I got most of that actually that time. Matt - It sounds strikingly clearer! This is an illustration of something that’s long been known about speech perception and perception in general. When you’re perceiving something, you’re not only processing the external sensory signals so the sounds in this case. You’re also using your knowledge, your prior knowledge of the world and of the messages and information that you’re expecting to change the way in which you perceive something. So that’s a very striking effect here, when you know what's being said, the speech sounds a lot clearer. Tom - Do we know what’s going on in people’s brains when they’re unpicking this challenging speech? Matt - That’s something that we’ve been studying a lot in the last year or to. We’ve been using two different forms of brain imaging to look inside the brain and see what activity is going on when someone listens to degraded speech, just like the ones that I’ve played to you. The theory that we’ve been developing that explains our observations is based on an idea called “predictive coding.” You’ve probably encountered “predictive texting” on your mobile phone now, in crude kind of way, that’s a model for what the brain is doing. So the brain is continuously trying the sensory signals that it’s receiving and, when it process sounds, it’s doing so in a way that’s guided and informed by the predictions that it had. When you know what’s about to be said you have very accurate predictions, and that’s what makes perceiving the degraded speech sounds easier is that your predictions become more accurate; they’re closer to the sounds that you’re hearing. Matt - What we found is really, really very interesting. It shows that once again, the brain predicting the sounds that it’s going to hear that seems to be involved in that tuning in process. So, people who start off an experiment finding degraded speech very difficult to understand, with minutes or hours of training get better and better at understanding that speech, and part of what’s making it better is that they’ve improved their predictions for what that degraded speech will sound like. And that’s a very useful thing to learn because it allows you not only to understand a particular sentence but also to understand other sentences and other speech sounds that you might never have heard in that degraded form. I think it’s very similar to what’s going on for someone with a cochlear implant. Tom - So by listening to degraded or challenging speech with subtitles, you then get better at understanding degraded speech more generally? Matt - That’s absolutely right. I was reminded of this when I watched the American TV series “The Wire.” The characters all have a very strong Baltimore accent which I found, initially, very hard to understand. Switching on the subtitles helped me understand what the characters were saying, but it also helped my tune into that unfamiliar accent. So by the time I’d watched two or three programmes actually I could do much better without the subtitles on. Having that extra support that you get from subtitles doesn’t just help you in immediate understanding, it also helps with learning. Tom - Matt hopes that using these techniques may help implant users adapt to their new hearing more quickly. Matt - What our research suggests is that during that period of adjusting and adapting it will be helpful for those listeners to watch the TV with the subtitles on. To listen to talking books whilst reading the text of the book. That that extra support doesn’t only help them in their immediate understanding but will also help them to tune in, to adjust to the sensations of sound that they receive through their implant..
Connie - Yeah, yeah, about an inch long, half an inch wide and kind of bumpy. It's black but with a silver tinge to it when you look at it in the light. And the thing that really strikes you when you get this it it's really, really heavy. Connie - You think? It's definitely at least a bag of sugar so that's how I'd do my measurements, so it's at least half a kilo. And it feels like a visual illusion every time you're holding it, I think, because it just doesn't match up but my brain thinks something is wrong! And the other thing it came with is a lovely little sign telling me a bit about it. Connie - From Gran Chaco - oh this is tricky - Gran Chaco Gualamba, Argentina. Found - and so this is how I know they didn't order it from space - found in 1576. It's really old! I mean it's space rock so it's really old, but it's really old to this world too which I thought was quite amazing. And then it's kind of got what it's made of and the main thing is iron and that's why it's so heavy. Graihagh - Given we've all been so excited, none of us have looked anything more into it. Graihagh - So I'm going to make it my mission to find out as much as I can about this rock. Connie - And if you can get some form of certificate, I'll be particularly happy. 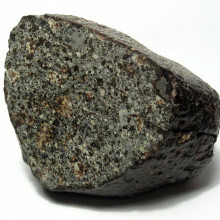 Graihagh - So a certificate, and as much as there is to know about this lump of space rock as possible. 33:04 - What is a meteorite? What's the difference between a meteor, meteorite and meteoroid but also a comet and an asteroid? 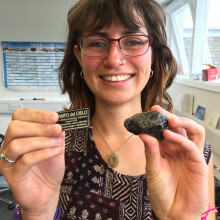 Graihagh Jackson wanted to get to the bottom of which space rock was which, so spoke to meteorite enthusiast Carolin Crawford, from Cambridge University's Institute of Astronomy. Carolin - Yes, it is complicated and astronomers do love our terminology. So, you've got lots of lumps of rock; the debris that you said floating around in the solar system. Now if it is made of ice - like a frozen iceberg 5-10 kilometres across or smaller, we tend to call it a comet even though it might have bits of dirt and dust within it. So comets are the icy bodies. 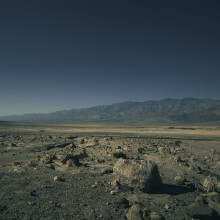 Asteroids are the rocky debris. And we won't talk about things called Centaurs which are half ice half rock. They're out beyond Neptune - we won't worry about them so much. But, basically you've got your asteroids which are rocky and you've got your comets which are icy. Now a meteoroid is like a tiny asteroid. You're talking about a few microns across to a few metres across in size. So it's just debris, like the asteroids, left over or fragments from a collisions or protoplanets, that's been hanging around for billions of years in the solar system and floating around between the planets, around the Sun following their own orbits. 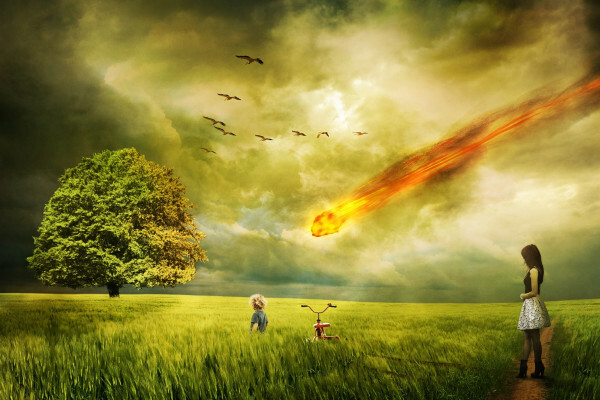 Now as soon as that meteoroid starts to enter Earth's atmosphere it becomes a meteor. That's what you know as your shooting star and that's when you see it burning up in the atmosphere. It sort of excites the air molecules and you get this trail of ionised particles which shine, and you also get the lump of rock, even if it's tiny, it will still give of an amazing amount of light because it's travelling quite fast. Most of them disintegrate in the atmosphere completely but, if they survive to hit the surface of the Earth, then they become a meteorite. So that's the distinction: Meteoroid when it's in space, meteor when it's in air, and meteorite when it's sitting on the ground. You get three basic types: The most common ones are the ones that are rocky. Then you get the iron ones, so that's iron and nickel alloy. And then you get stoney iron which are the mix of the two. Graihagh - Dare I say, a bit like sometimes when I'm walking down the street and you see all the little bits of rock within, what's it called - pebbledash is what I'm thinking of but in a miniature polished form. Is that a terrible thing to say? Graihagh - It reminds me of... do you remember The Futurists (the painters) - The Futurists. You know how they had these very choppy, jagged types of paintings - that's what it reminds me of. Carolin - Or it just looks like a parrot! It is deformed. I mean you look at that and you see a mangled bit of metal and you think gosh, that metals gone through a lot to get to be that shape. So this fell in the Sikhote Alin mountains in 1947. Carolin - They come from a number of different places, but you're quite right, they're lumps of space rock or, if you like, space metal that are floating around there orbiting round the Sun. Now some of them, especially those rocky/stoney ones, are left over from the original solar system formation. They are bits that just didn't get incorporated into being planets. Or they could be fragments of asteroids. 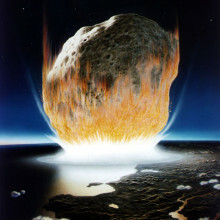 You know, you can imagine protoplanets in the early solar system, asteroids now colliding and shattering fragments off. And then you have some that are really exciting and they're where a meteorite has impacted another planetary body. So it's something like the Moon or Mars or say Vesta, the largest asteroid in the asteroid belt. And when the meteorite impacts that body, it send ejector out but because things like Moon, Mars, Vesta don't have so much gravity, not all of it falls back down to the planet. It then goes out into space and starts orbiting the Sun and, maybe millions of years later, it happens to fall on Earth. So some of these meteorites are bits of Mars, they're bits of the Moon, or bits of Vesta. Carolin - Which is surprisingly common. If you look at Vesta, this is the object that's about 500 kilometers across in the asteroid belt, it looks a bit more more like a punctured football. It's got a huge sort of gouge out of the southern pole and that's where we think it underwent a huge collision sometime ago in its past. So there are lots of fragments of Vesta around and this is one here. So, when you hold something like your Campo del Cielo that's completely metal, that would have come from the inside of one of these differentiated bodies. So like a small asteroid that was forming or a protoplanet that was forming before it got smashed so you've got a bit of the core part of the asteroid there. A lot of these stony meteorites are much more of the pristine debris left over from the early solar system. Graihagh - Is it quite rare for this sort of stuff to fall to Earth or is it quite common? Carolin - I think it's pretty reasonable. Well it also depends on which fall the meteorite comes from, so you can get very particular falls where there are fewer pieces found, or it’s particularly famous fall or something about it. For example people are very interested in the recent fall in Russia – if you want a bit of that meteorite you will get a higher cost per gram for the meteorite than you would from things that are a dime a dozen like cico tallin or im afraid your Campo del Cielo. 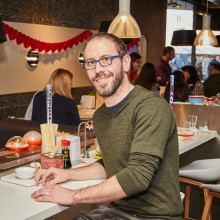 Matt - My name's Matt Taylor. I work for the European Space Agency on the Rosetta mission that's gone to a comet. Was that OK? We sent the spacecraft up in 2004, it chased down the comet over ten years. In 2014, we turned the spacecraft back on because we'd had the time period where we were in hibernation, we caught the comet, we landed on the comet with Philae and, for the last two years, we've been orbiting the comet and measuring - looking at it's surface structure and how it evolves in time because a comet is really interesting in that when it goes past the Sun it becomes very active. There's a lot of ice inside it that throws of tons of gas and that peaks when you get near the Sun, and then starts to drop off and move away from the Sun. With Rosetta we've sat next to it all this time observing how that stuff evolves, what the surface does, the surface changes. We think about a metre of the surface disappeared in the time that we've been with Rosetta. Matt - It's actually the beginning. It's when, although we have been doing science already, it's when you have only time to do science. And that's when we'll be doing the big leaps and bounds and the breakthroughs with Rosetta when we have all that time to do the science, and there's decades of work to do on this data. Matt - Yes. There is a number of, how can I put it, aromatic compounds on the comet that we thought would be really nice to engage people with by saying, this is the stuff. You can visually see the tail and everything but you can't see the gas, but you can smell the gas. And we have a mass spectrometer on both Philae and also the orbiter Rosetta. The one on Rosetta has picked up some fantastic stuff; sulphite compounds, rotten eggs, ammonia, a stable so you can imagine what this comet smells like but we thought it would be best to provide a 'scratch and sniff' version for people to enjoy and there have been various reactions from 'it's not that bad' to the 'is it a perfume?' to a child was nearly vomiting on the monitor earlier on... so yes. It stinks basically! Matt - It's perfumy isn't it, yes? But, I mean, the thing is somebody's was saying it's got incense. This one's actually not as bad - maybe I'm used to it now! But, as I say, it's got hydrogen sulphide, ammonia, formaldehyde, methanol. 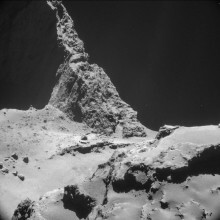 We've also detected on the comet things like hydrogen cyanide but then you wouldn't want to put that on there because you'd sniff almonds and then pass out and and probably die. Graihagh - So, other than getting a whiff of what 67P smells like, what would be the best outcome here? I mean surely we're not going to unpick the entire origins of our universe and solar system? Matt - Well, with Rosetta we are starting to do that. Really what we've got from Rosetta by spending the two years there by landing with Philae. And adding all of this stuff together, we're just starting to scratch on the surface of the capability of the data from this mission to the extent that we think we have identified primordial building blocks in the comet that are, actually, probably, common with other comets, that we can say we think we know how comets were made now. And that's quite a big result and the implications there lay in with the general solar system evolution, so that's what we have to look forward to. I wouldn't say that we've solved verytihng, but we've done a good job and there's a lot still to do and I'm pretty excited by the science that's going to come out in the next couple of years with Rosetta. 56:01 - How did birds survive the dinosaur mass-extinction? If an asteroid wiped out the dinosaurs, but birds are dinosaurs, what the heck is going on? How did birds survive the dinosaur mass-extinction? Tom O'Hanlon put Fay's question to David Norman from the University of Cambridge. David - The overwhelming evidence suggests that there was a massive meteorite impacted at around about 66 million years ago. And the explosion created a huge set of environmental problems, in a sense: lots of water vapour, lots of chemicals introduced into the atmosphere, completely messing up our ecosystems. The equivalent, I suppose, in terms of modern theorising is the nuclear winter. It’s as though there was a nuclear holocaust, almost destroying life on earth, but not quite. Tom - Given that we’re still around today, some things clearly made it through. So was there a pattern to who lived and who died? David - Certainly on land, anything over a metre in body length probably went extinct. It maybe something to do with the biological nature of small organisms. Most of the big ones are, you could say, top of the food chain and, perhaps, more specialist and most susceptible to environmental disturbance. That’s certainly the pattern we see in ecology today. The things that have most chance to survive are the scavengers, the small fast reproducing sorts of organisms. And, in a way, the lizards, the snakes, the small crocodiles, small mammals that were our ancestors, and various other little organisms seem to have got through because they were the most resilient to environmental disturbance. The little, insulated, feathered bird-like dinosaurs also got through and, therefore the dinosaurs did survive the extinction, but they survived because they were small bird-like creatures rather than big scary dinosaurs. Tom - I suppose we’re really grateful for today? David - I guess so, yeah. Although some of us would actually quite like to see a dinosaur in the flesh at full size. The nearest we’ll ever get to it is something like an Emu, or an Ostrich, or a Rea. They’re feet, especially with something like a Rea have those three classic taloned toes which look very, very reptilian and wouldn’t be so ; different, except in scale, from something like the feet of a dinosaur like T. Rex. Tom - There you go Fay. I hope that managed to meteor your expectations.